Hi Everyone! Oooo I got lovely nail mail yesterday, 3 bottles of Sweet Color nail polish from Born Pretty Store, which one to try first!! Today I'm going to show you shade S138, a beautiful dark red base with pink shimmer running through it. A gorgeous polish, very rich & velvety and in the sunshine the pink shimmer gives a wow factor as it glistens in the sun light, lovely! 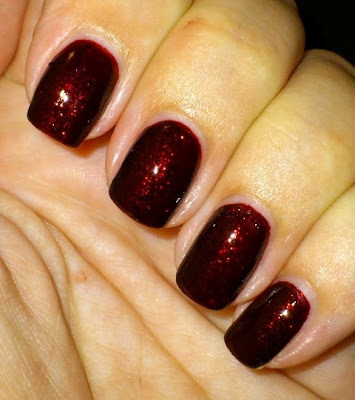 A decadent nail polish, looks like a very expensive brand. The Sweet Color range is available in lots of diffeent colours, shimmers, cremes & glitters - all wonderful! 12ml bottle. Highly recommended! The Sweet Color Shimmer Candy Nail Polish is currently $6.14 / £3.96 / €4.60 and if you use my discount code HXBQ10 you get 10% off!! Check out the Born Pretty Store website for loads of cool nail art goodies.